If you’re ready to go quickly, I’m assuming you’ve already settled on a name. The first thing you need to do is check to make sure that domain is available (you can search for available domains here). If it is, you want to purchase it (but read the rest of this section first!). Without your domain, you don’t have a blog. Since you will need a host to take care of your site, you should try to buy your domain from them because they will often give you a good deal. I used GoDaddy for my first site and after researching again, decided there was no question – I was sticking with GoDaddy. If you go with them, their best deal for a domain (free) and hosting package (including WordPress setup) is here → GoDaddy Managed WordPress Hosting. *You will want to set your blog up on WordPress, so if possible opt for a WordPress package. I did this with GoDaddy and I was ready to start creating my sites within minutes. Many of the other hosts will also offer similar packages. Once you’ve purchased your domain name and know it is truly yours, you want to reserve all of the social media accounts you plan on using, even if you don’t have time to set them up now. The last thing you want is to find out that someone else claimed them 6 months down the line. Even if you don’t think you’ll be using a social media platform, you should claim the account just in case (they’re all free anyways). Next you will need to pick a theme for your site. There are tons of free themes, so you don’t need to pay for one right out of the gate. Most of the reasons for choosing a theme are personal, so play around with them until you find one that you really like. There is one thing, however, that matters more than anything – mobile friendliness. You theme absolutely must be mobile friendly. In fact, it doesn’t even really need to be desktop friendly. It’s that important. Almost 90% of my traffic comes from mobile! And that statistic is standard across most blogs these days. If you see a theme that you like, take a look at it on your phone first before you fall in love. Google (and readers) rewards blogs that are consistent, so try and come up with a schedule that you can manage and schedule posts ahead of time so that you always have something coming up. Don’t take on more than you can handle. Some bloggers only post once every other week and that’s fine, especially if it’s high quality content. Try and make your posts longer than 500 words and definitely longer than 300. The longer, the better. What you really want are SEO-optimized blog posts that pull traffic from Google, but that takes time and it can be tricky. Social media, on the other hand, can be instantaneous and in some cases, viral. Believe it or not, it will also help you with your Google ranking! Consistency is rewarded on each platform, just as it is with Google. So make sure to keep your posting, pinning, and tweeting as consistent as possible. For Pinterest, try to join Group Boards. Search for blogging support Facebook groups. You will find a wealth of information there and many will help to boost your pages. The point of the Quick & Dirty approach is to get yourself up and running so you can learn and be productive as quickly as possible. But you will never stop developing your blog. That’s part of the magic. Study blogs you love and emulate (but don’t copy) what they do. Additional blog pages – You will want to develop an About Me/Us page, a Contact Us page, and a Disclosure policy (this site will help you create a disclosure policy). Your first ads – Google Adsense is the easiest place to start with if you want ads up on your site in the beginning. They have pretty low standards for who they accept, so it won’t be long before you can use them. Your first affiliate – Amazon is, by far, the biggest affiliate out there and they, as well, are pretty easy going about who they accept. When you feel like you’re ready to start recommending products, Amazon is where you want to start. So there you have it! 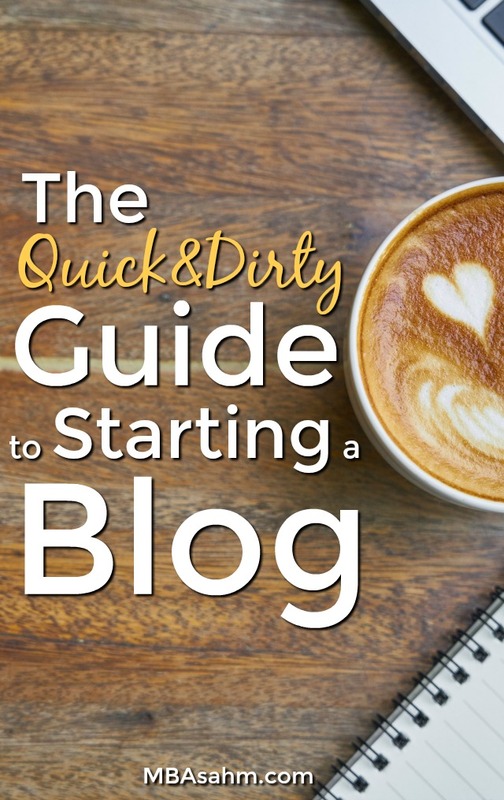 A quick & dirty guide to starting your first blog! I could go on for hours talking about this stuff, so don’t hesitate to reach out if you have more questions. 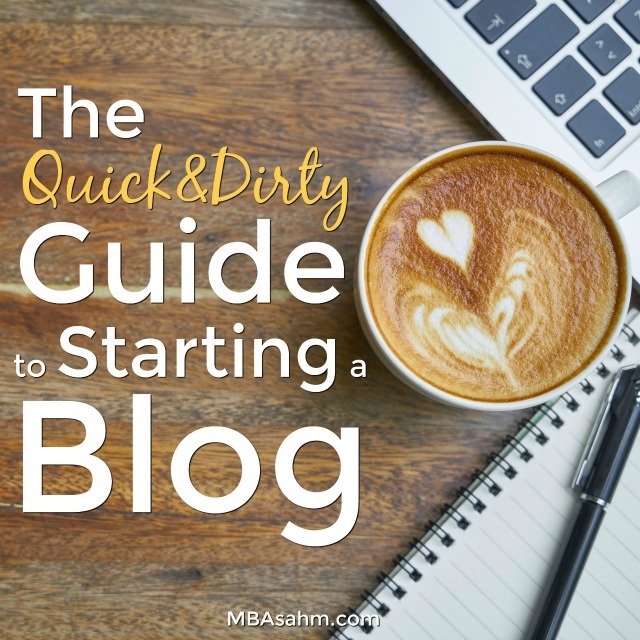 Blogging has completely changed my life and I’d love to see it do the same for you. Good luck!